Little 지승 (Ji Seung) was baptized yesterday!!!!! Last Monday we had a birthday party for twin girls who were baptized in February but had to stop coming to church in April because their grandma forbids it. We're hoping to still fellowship them and keep them close to the church until they move out. 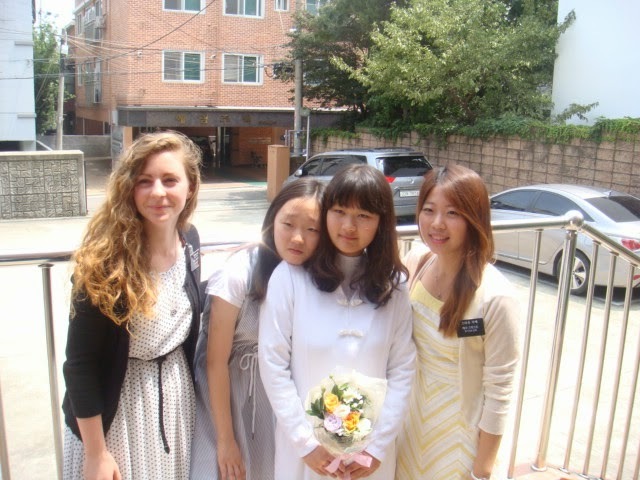 We met 지승 (Ji Seung) everyday this week to finish teaching her the lessons and prepare her! Missionaries used to teach the 5th lesson (laws and ordinances) after baptism but it's now required to teach it before baptism. She's just so cute and prepared! Transfers were this Wednesday. It didn't affect us but we got two new elders and a new flatmate. We had two meals at members' homes this week!! On our way to one we saw a woman looking at us while we waited for the bus but we were talking to someone else so we didn't talk to her and lost track of her. When we got off the bus we noticed that she got off with us and she called out to us asking who we were. We excitedly told her who we were and talked to her briefly as we walked into the area of apartments. We got her number and we gave her a Plan of Salvation pamphlet. As we were going to the apartment where our member lives, we got a little turned around and it took us a little longer than normal to get in. But once we walked in we saw the same woman come in through another door! And she knew our member! When we went to our member's apartment she told us to go get her so we could all eat and teach her together. So we went up to her floor to find her and she lived behind the first door we knocked on! 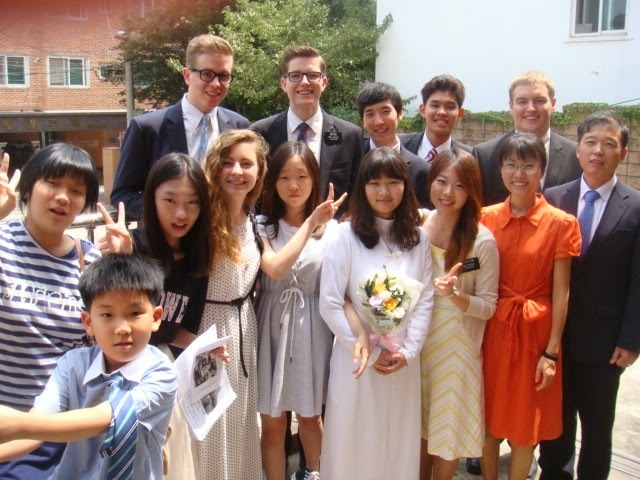 We had an exchange this week with our 김포 (Kimpo - and area) sisters! Sister van Weezup came to 목동(Mokdong) with me. she so happy and positive she makes everything seem better! I love her so much! 지 승's (Ji Seung's) baptism was really good! It was so fun to see the difference in her after her baptism! The ward provided snakcs afterwards. She told me that A child's Prayer is her favorite church song so we surpised her and sang it for her. We also bore short testimonies. 예림 (Yeo Rim - another young investigator)sang a song too! It was so cute! I'll send you a program later. She and 예림 (Yeo Rim) are going to youth conference this wee kand we hope that it will really help them and introduce them to good friends!